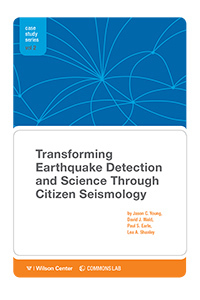 The report describes how the USGS and others are engaging the public and advancing earthquake monitoring and knowledge of seismic events. The ultimate goal, according to the USGS, is to provide more rapid earthquake detection and generate more real-time hazard and impact information. The efforts discussed in the report include the Tweet Earthquake Dispatch (TED), which uses an algorithm to provide seismologists with initial alerts of earthquakes felt around the globe via Twitter in less than two minutes. The report also examines the Quake Catcher Network, which equips the public with low-cost sensors to collect information on seismic activity, and Did You Feel It? (DYFI), which uses the Internet to survey individuals about their experiences in earthquakes, including location and extent of the damage. Throughout much of the world earthquake sensors are sparse or nonexistent, meaning it can take the USGS up to 20 minutes to issue alerts about an earthquake. These crowd-focused systems – which are seen to complement, rather than replace, current systems – provide agencies like the USGS with a fast and inexpensive way to expand their ability to monitor seismic activity. The report also looks at how future efforts could be improved. Successful crowdsourcing projects at the federal level must navigate a web of practical, legal and policy considerations. This report identifies some of these hurdles and provides lessons learned so that others may apply them to their unique missions. “Greater dialogue is needed between scientists and policymakers on issues from privacy to democratic participation,” the authors conclude. The initiatives are garnering interest, largely because they produce valuable data with a wide range of applications very quickly and in a cost-effective manner.